easy | Live Cheap, Feel Rich! Don’t overpay for this popular costume when it can be made in such a more original, budget-friendly way. These are so awesome! Cut your pipe cleaners to whatever length you desire. Luckily, each minion has a slightly different look, so you can be as creative as you like. Thread through the knit hat, go slowly and it should slip right in! Bend the pipe cleaners so they stick up however you like. Cut off a small section of the paper tube, 1/2 inch thick. If you cant two eyes, you can cut another section as well. Paint them silver and allow to dry. Once dry, staple together in the center. To attach to the elastic, simply staple as well. 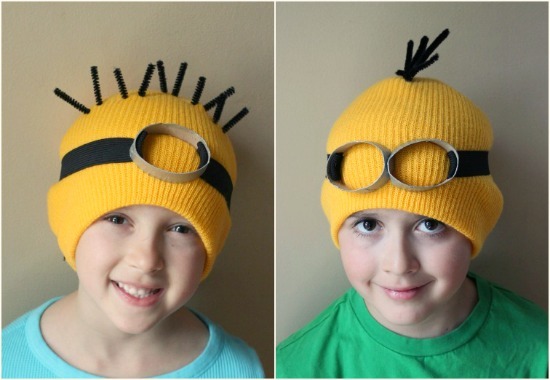 You can place on your face, or even on the hat on the forehead. Wear a yellow long sleeve shirt, blue overalls, black gloves + boots, and you are GOOD TO GO. Minion! Thanks, MakesAndTakes.com! 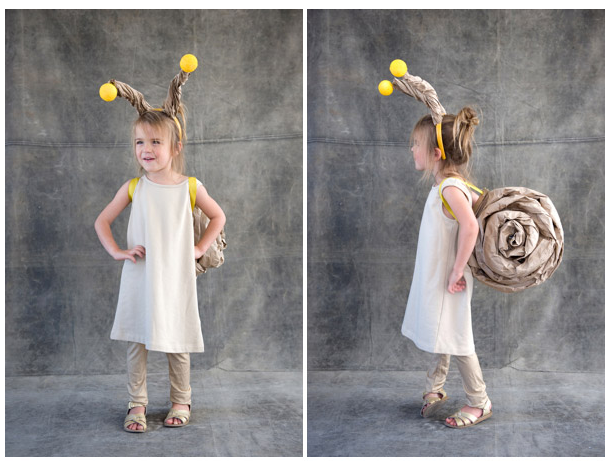 This is an awesome last minute costume idea, and cute to boot. Pretty easy and self-explanatory, but here’s the jist of things: Stuff the pairs of black knee socks full of plastic grocery bags, attach to hoodie – if you aren’t comfortable with a quick sew, feel free to safety pin or even duct tape. To the hood, attach adhesive white dots and glue on the googly eyes. 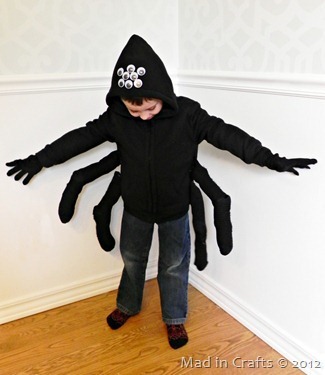 Slap on the gloves, zip up the hoodie, and voila, you’re a spider. Thanks to MadInCrafts.com for this adorably scary getup. I can’t get over the cute of this costume, brought to us by OhHappyDay.com – so very adorable! First, make the shell. Crumple up the paper, and starting at the corner, begin rolling it. Once you have a nice section, begin wrapping into a shell, until it is at desired size. Go back and redo with the glue gun to secure it in a few places. Next, make another half shell, and glue the two sides together. Take a square of cardboard and mount it to the shell. Tie ribbon to it to make it a nice little backpack! Next, make the headband – take a dection of brown paper and crumble until it can stand on it’s own. Add styrafoam to the end, and hot glue the other end to the headband. So cute, so easy. Love this! If any of you try these out please send over some pictures! We’d love to see how you all look! It seems like everywhere I turn, there’s something pumpkin flavored or pumpkin spiced something. I used to think this was such a novelty, but now it’s almost overboard! I’m admittedly a huge pumpkin-spice latte fan, from Starbucks. I went to get one at the beginning of the season though, and it was $6. $6. $6! For a coffee. I thought that in honor of #NationalPumpkinDay it’d be appropriate to give you all a homemade pumpkin spice latte recipe that you can make on your own for considerably less money. This recipe, from Betty Crocker, makes 10 servings of pumpkin spiced lattes! Perfect recipe to finish a fall dinner party and serve with dessert. In a slow cooker, mix the following ingredients, and whisk until well combined: 5 cups strong brewed coffee, 4 cups milk (2% or whole), 1/2 cup heavy whipping cream. 1/4 cup canned pumpkin, 1/3 cup sugar, 1 teaspoon vanilla, 1 teaspoon pumpkin pie spice. Cover and cook on high for 2 hours, stirring once after the first hour. THAT IS IT. Serve in mugs and top with whipped cream if desired! How amazing is that? So easy, all inexpensive ingredients, and made in a slow cooker, no less – couldn’t be easier or less expensive. Enjoy! I’ve been doing some reading on local dollar stores. I used to bring my kids here all the time as a treat and let them each buy one thing (talk about an easy, inexpensive activity), but hadn’t been in a long time. I recently stopped in and was truly shocked by how much stuff I wanted to buy and knew I had use for. It’s not all junk and knick-knacks! I did some research and there are a TON of tips on items to buy at the dollar store that are cheap and convenient. Here are some of my favorite ideas! ChaChingOnAShoeString.com has this awesome tip to use the dollar store for anything from Easter basket fillings to Christmas Decorations. This is such a great idea, because as much as I *wish* I did, I so rarely store seasonal decor responsibly, and sometimes end up throwing it out. I won’t care nearly as much about this loss if it was inexpensive to begin with. I checked out DollarTree.com to see their Halloween selection and was absolutely blown away! From decor, to candy, to costume accessories, they really have everything to decorate your home for the season or a party – love it! I would have never expected this one! They won’t be your big brand names, but most cleaning products contain exactly the same ingredients, so they’ll still get the job done at a much lower cost. I cannot get over the selection that Dollar Tree has to offer. Dish soaps, air fresheners, paper towels – literally everything you could ever need in the basic cleaning spectrum. Does anyone else think that it is SERIOUSLY INSANE that greeting cards these days cost so much money? I recently got one for a friend’s baby shower and it ran me $5. For a piece of paper. Unreal! This tip really speaks to me, because to get a card for $1, or, better yet, a 20-pack of cards for $1 is really such a game changer. Will be pivoting these purchases to the dollar store immediately! Love this tip from BargainBabe.com! Brand name batteries can really run you up a charge, and I am entirely fine with these no-name batteries to keep in the household to have on hand for toys, remote controls, etc. Nothing is worse than being withheld from an activity because you’re out of batteries! There is never NOT a need for sandwich baggies in our family home. In my opinion, all sandwich bags are created equal, so why not simply pay $1 for a package of them? Check out the selection from the Dollar Tree – there’s literally every size and every style. You’ll want for nothing! Obviously there is a limit and a line to be drawn here, but there are certainly some products that could easily be bought from the dollar store. Dollar Tree carries some brand names from E.L.F. to Wet N Wild – not too shabby for makeup and nail polish! The funniest thing that so many blogs said was that you should get pregnancy tests from the dollar store! As long as they’re accurate! These retail for anywhere between $10-$20 at your average drug store. Hope this helps! What’s your go-to buys at the dollar store? I can’t believe it’s already Wednesday! This calls for a freezer meal roundup! This week I thought it’d be fun to focus on desserts. 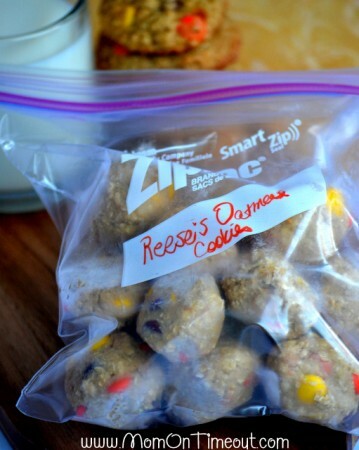 There’s a VAST amount of recipes for all of your favorite sweet treats that freeze perfectly. They are prime freezer candidates! I pulled some recipes from around the internet that looked especially delicious to me. Let me know what you think! I can’t wait to try them myself. Ruth Soukup is a freezer-friendly queen. This is far from the first recipe I’ve tried of hers, and I imagine it’ll be far from the last! 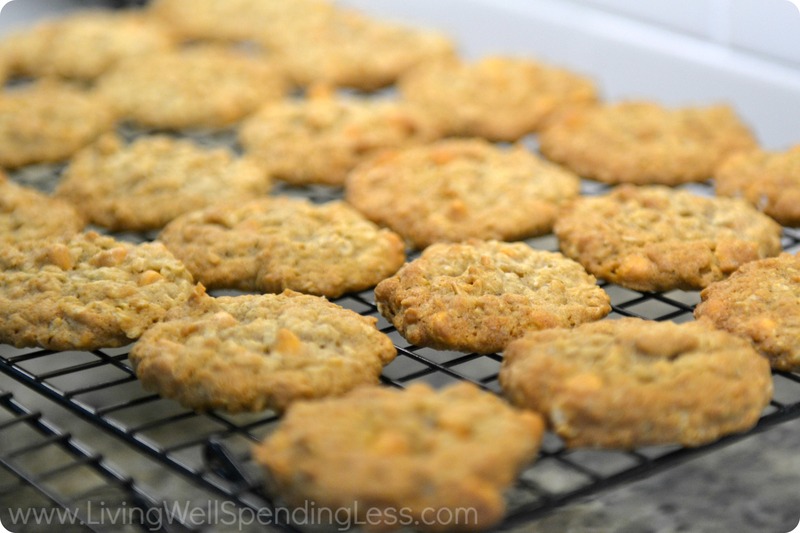 My husband and I are both huge supporters of oatmeal cookies, and this looks like a fantastic spin on such a classic cookie. She claims that they ‘freeze beautifully’ and are just as good straight out of the freezer as they do straight out of the oven. Sounds good to me! This recipe makes about 4 dozen cookies. Preheat the oven to 350, and get to work mixing together butter and sugars. Add in eggs and vanilla and mix well. Then flour, baking soda, cinnamon and salt, and mix well. Add in oats and chips, and mix well. Drop by rounded tablespoons onto an ungreased cookie sheet and bake for 8-10 minutes or until light golden brown – cool + enjoy! Freeze if desired. These little brownie bites are perfect for a small dessert or a snack. They’re such an easy, quick recipe! Melt butter and chocolate chips in a microwave safe bowl. After melted, add cocoa powder and stir well. In a separate bowl, whisk eggs and add in sugar, vanilla, and salt. Add in the chocolate mixture and stir until well combined. Lastly, add in flour and mix until smooth. Grease a mini muffin pan and fill cups 2/3 full. Bake at 350 for 10 minutes and let cook before removing from pan. 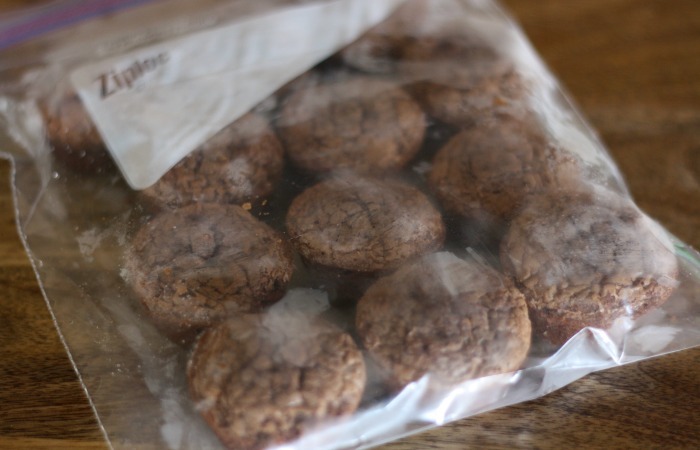 Let them cool completely and enjoy or place in a freezer safe bag. To reheat, just pop them in the microwave! Can you tell I love oatmeal cookies? Have I mentioned my affinity for anything peanut butter? This recipe looks so good that it needs to be shared! The beauty of this recipe is that it highlights two things: 1) these cookies are great to freeze and equally delicious this way and 2) how easy it is to freeze cookie dough balls (if you’d prefer to eat them fresh and make the dough ahead of time!). Simply cream butter and sugars together until light and fluffy, beat in eggs one at a time, add vanilla and mix together. In a separate bowl, combine oats, flour, salt and baking soda, and add to the already creamed mixture. Stir in Reese’s Pieces and Reese’s Peanut Butter Chips. Refrigerate for one hour and preheat the oven to 350. Drop by rounded tablespoons onto parchment lined baking sheets. Bake for 10-12 minutes until light brown and cool. In honor of #worldeggday, I wanted to take this opportunity to teach everyone the easiest way ever to boil an egg. For the longest time, I’d forget, wing it, and either have wildly over or under cooked eggs. That is seriously all there is to it! I promise perfectly cooked hard boiled eggs every time. Quick breakfast on the go? 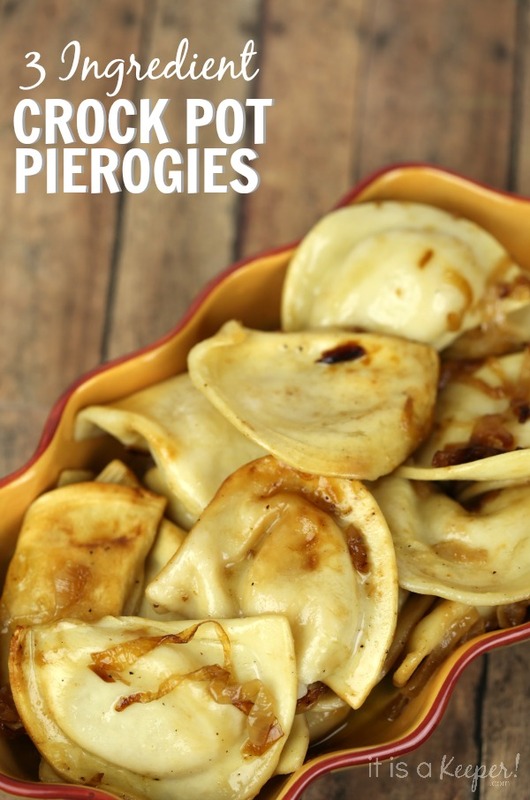 This one’s coming out of left field, but I love pierogies SO much that I cannot help but share some easy recipes that will please literally anyone. If you don’t like pierogies, I don’t even know what to say. First, some history. Pierogies are filled dumplings of Eastern European origin. They’re made by wrapping pockets of unleavened dough around a savory or sweet filling. Generally, we’re working with potato and cheese, but there’s also fillings along the lines of sauerkraut, ground meats, and fruits. They’re generally served with melted butter, sour cream, or fried onion (or all of the above). I will not sit here and tell you these are ‘good for you’, but they are certainly incredibly easy to make and so, so delicious. A lot of people, including myself, sticks generally to the frozen pierogies you find at your local grocery store. That’s why I am going to start with a recipe that uses these frozen pierogies, and simply makes them more delicious than you’ve probably ever prepared them before. ItIsAKeeper.com hits us with a simple recipe, 3 ingredients: 1 package of frozen pierogies, half a cup of butter, and one onion, thinly sliced. The directions? Put them all in a slow cooker, put on the lid, and cook for 3-4 hours. Equally as easy, and such a fun spin on pierogies, TheKitchenMagpie.com curated a recipe for Crockpot Lazy Pierogie Casserole. Intrigued? So was I! 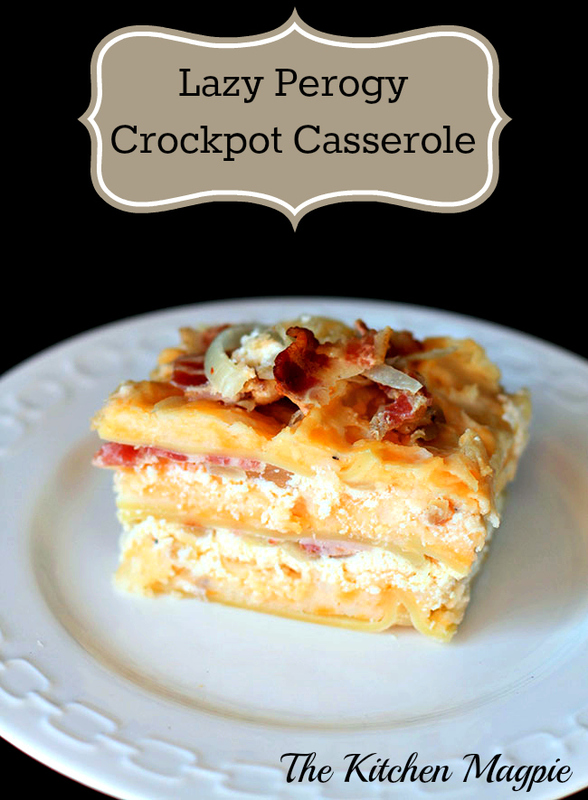 This doesn’t involve any real pierogies, but takes all of the best elements from them and combines them into a delicious lasagna/casserole – potatoes, bacon, cheese…yum. To prepare the crockpot, you’ll need to boil lasagna noodles, peel, dice, and boil potatoes, mash potatoes with cheese, milk, and spices, prepare a ricotta cheese mixture, fry up some onions, and cook up some bacon. May sound like a lot, but all of these things are pretty basic and take minimal prep time or skill. Then starts the layering in the crockpot, starting with lasagna noodles. Then spread ricotta mixture on top of the noodles, then goes the potato cheese mixture, then bacon and onions. And repeat! Cook in the crockpot on low for two hours – and you’re done! I saved the most challenging pierogi recipe for last: homemade pierogies. Dun dun dun. That being said, the perk here is that your work will go a long way – this is a great freezer meal! To make the dough: combine potato flakes and boiling water and allow to cool. Add remaining ingredients (2 beaten eggs, salt, and all purpose flour) and mix until dough forms. 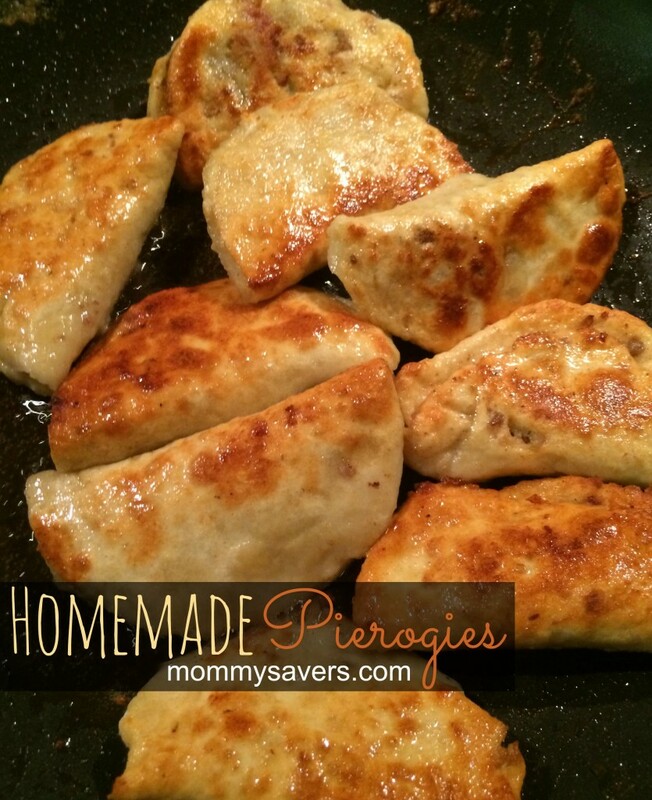 Roll out dough and use a round cookie cutter or glass to make rounds for each pierogi. Brush each round with beaten egg, flip over, and add about a tablespoon of your homemade pierogi filling – my favorite is potato and cheese and couldn’t be easier. You can always add bacon – it’s really up to you! Whatever your favorite is. Seal the pierogi shut and boil until they rise to the top (about 3-4 minutes). Once done, saute in a frying pan with butter – feel free to add onions! Serve with sour cream. To freeze: allow pierogies to completely dry after boiling, lay flat on a cookie sheet and freeze. After they’re frozen, feel free to place in zippered plastic bags. To serve, thaw completely and saute to finish cooking. That’s all! Enjoy #nationalpierogiday and please let us know if you have any recipes of your own for this delicious treat! Back to basics here, everyone! I have three VERY different, but VERY delicious freezer-friendly meals today to make your life just that much easier. Don’t forget that when you try these out, give us your feedback! Did you add extra ingredients, leave some out? Do you think the cooking time should be increased, decreased? Do you have different ideas on how to allow this to keep for longer in the freezer? We want to hear everything, big or small! Comment section is there for YOU. She makes her own pizza dough. You could store buy (I know that a lot of grocery stores sell raw pizza dough), but this is more cost efficient, and you’ll know exactly what you’re putting into it, which is only 8 ingredients, and nothing funky: water, yeast, honey, olive oil, salt, flour, italian seasoning, and garlic powder. Once you’re all set with mixing and letting the dough rise, preheat the oven and cook the pizza dough WITHOUT toppings for about 7-8 minutes to allow for a good base to build on. She makes her own sauce too! Who’s shocked?! You can, of course, use store-bought, but I love love love the idea of knowing all of the ingredients you and your family are eating. She simply uses tomato paste, sauce, water, garlic powder, basil, parsley, organo, thyme, salt, papper, olive oil, honey, and Parmesan cheese. The full recipe is in here and can be made in a stockpot or crockpot. Once done – this sauce is totally freezable – simply put in a tightly sealed plastic bag. Pizza topping ideas: since we’re freezing, use things that will freeze well. She recommends cheese, pepperoni, pineapple, onion, chicken, ground beef or turkey, green onions, olives – most things do freeze well, so go with your standard toppings! 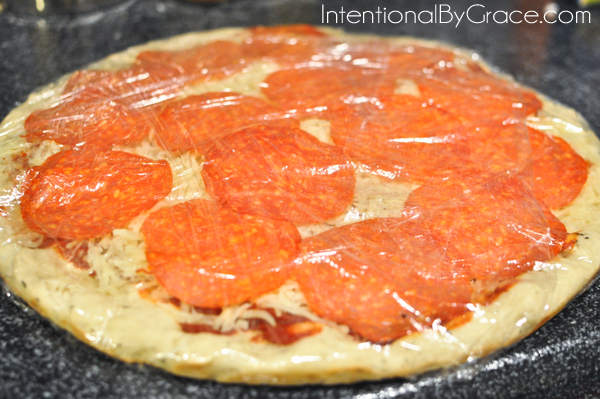 Once your pizza is assembled, wrap each pizza with plastic wrap and finish with foil. The foil allows easy writing to label which toppings are on which pizza – love it! To cook, preheat your oven to 425, remove all the wrap, place pizza on a pan, and cook for about 15 minutes. Simple! Next up…Slow Cooker Tuscan Stew from Sweet Peas and Saffron. With the weather getting a bit cooler, I crave soup, and it’s one of my absolute favorite things to make since it’s easy, inexpensive, and I can eat it for days. It’s one of the only foods where I can say with all confidence that the leftovers are better than fresh! That overnight in the fridge or freezer really just must enhance all the flavors – blows my mind every time. Here’s a new recipe that I found that looks so comforting and delicious – cannot wait to try. 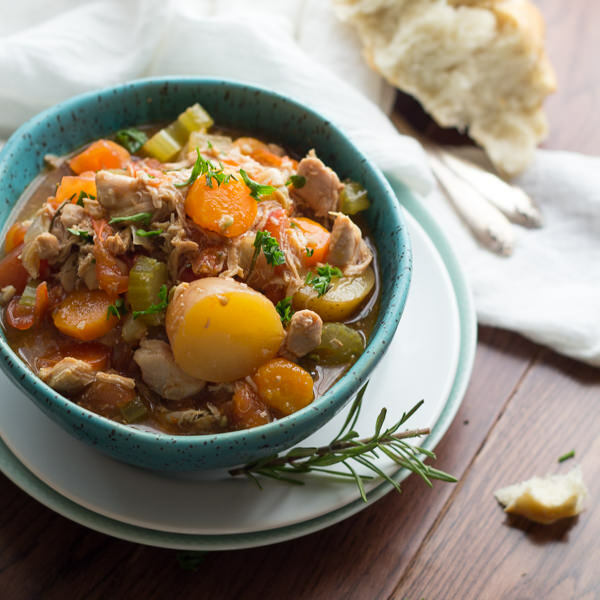 Sometimes a beef stew is almost TOO hearty, so I love this chicken-based spin. Simply add boneless chicken thighs, carrots, celery, onion, garlic, tomatoes, potatoes, chicken stock, tomato paste, white wine, and fennel seeds into the slow cooker and cook for 4-6 hours. Just before serving, mix cornstarch and water together, and add in balsamic vinegar, rosemary, and salt – throw combination into the soup. Serve with crusty bread or a side salad! This sounds soooo good. If you want to freeze this prior to putting in the slow cooker – easy! Just get your ingredients together, defrost, and dump. I’m dying to use my slow cooker more (she notes that she uses a 5 quart one) and this sounds like a great, easy opportunity to play around a little bit. This stew looks chunky and hearty and perfect to fill up my family on a cold, cozy night! Enjoy! 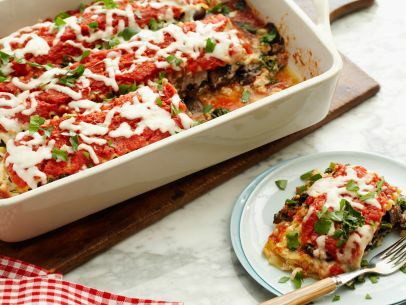 Next and last…Healthified Kale and Portobello Lasagna. When I think about freezer meals, my mind immediately goes to lasagna, and then I think, ugh, not healthy enough. I always miss a more veggie-laden meal. But the Food Network puts such a healthy, unique spin on freezable lasagna! I can’t wait to try this recipe. This only takes about 25 minutes of prepwork, and execution of the layers is almost exactly like putting together a more standard lasagna dish. Puree roasted red peppers, oregano, salt, pepper, and sugar in a food processor until smooth. Mix together mozzarella, ricotta, and egg whites in a separate bowl. Heat and saute portobello mushrooms and kale with red pepper flakes and set aside. In a baking dish, start layering! Sauce, lasagna noodles, cheese mixture, kale and mushroom mixture. At this point, you can freeze if you so please! Plastic wrap + tin foil to make sure this lasts as long as possible. When you’re ready to cook, thaw, cover with aluminum foil only, and bake for about 50 minutes on 350. Then sprinkle with some additional mozzarella and cook uncovered until bubbly. Yum! Enjoy these! Let us know how they go!